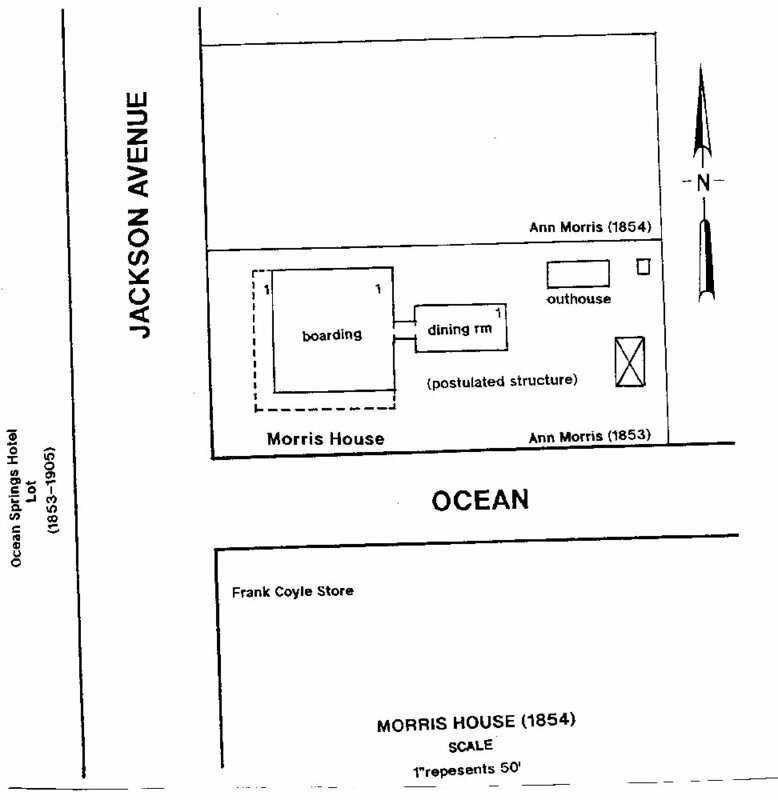 The Morris House was located on the northeast corner of Jackson Avenue and Ocean Avenue. No photographs or plans of the Morris House are currently known to exist. From a description of the house, it can be estimated with some degree of certitude that the structure was probably about 4000 square feet in area. The gallery may have been as large as 900 square feet. The Ocean Springs Gazette dated March 4, 1855 ran an advertisement to sell the Morris House. The ad read as follows: The undersigned offers for sale on accommodating terms, his new, large and spacious boarding house, situated on the corner of Jackson and Ocean Avenues. Said house is well furnished for a private boarding house, containing 24 rooms well furnished. The house is well supplied with furniture, a good cooking range, cooking utensils, etc. I will sell with or without furniture. The lot on which said house stands is 91 ft. 6 in. front, more or less, and 200 ft. in depth, or I will sell with it or separately another lot adjoining, 90 ft. front more or less, and 200 ft, in depth. Apply to the undersigned on the premises. James Morris was probably born in Ireland. His wife, Ann (1819-1900), was a native of Ireland, and came to the United States in 1832. They had ten children, but only Elizabeth Morris Hill (1848-1933), Emmanuel J. Morris (1849-1899), both born in Louisiana, and Kate Morris (b. 1855) probably born at Ocean Springs survived to adulthood. From the US Census, it appears James Morris died before 1860. At least four of the Morrises are known to be buried in the Evergreen Cemetery at Ocean Springs. Mrs. Morris ran the boarding house with the philosophy that the "object of the proprietress is to render the Morris House in every respect a home residence". (The New Orleans Times, May 20, 1866, p. 1). The Morris House, located on the main road (JacksonAvenue), offers every accommodation to invalids, families, and transient guests.Its location in immediate proximity to the chalybeateand sulphur springs, is a great convenience, and the facilities for sea bathing are unsurpassed. It presents every advantage of a watering place with the comforts of a private residence.(p. 2, col. 4). Elizabeth Morris married Thomas G. Hill (1839-1880+) from Alabama. Hill was a retail grocer at Ocean Springs. In 1896, Elizabeth Hill was the proprietor of the Morris House. She was a widow by 1900 living in Ocean Springs with her two daughters, Alice Hill Grayson (b. 1868), and Annie Hill Simmons (b. 1880) as well as her mother, Ann Morris, who would die shortly in October 1900. She also had a son, Harry Hill (1866-1915). In private family, single or in suits; with or without board. Terms to suit the times. Emmanuel Morris, called E.J., became a real estate magnate at Ocean Springs. Charles Dyer in Along The Gulf (1895) said this about Morris: Mr. Morris is one of the largest real estate dealers in this city and has done more towards the advancement and up building of Ocean Springs than any man who lives there. He is enthusiastic on the subject, and, if anyone is desirous of gaining any information on this subject, they would do well to write him. In 1898, Morris also owned a large lumber mill on Fort Bayou called the E.J. Morris Lumber Company. The Millsite Subdivision is located on this former plant site. The Morris House was probably the first boarding house built at Ocean Springs. It existed for approximately forty-five years on Jackson Avenue serving as a haven for travelers at Ocean Springs seeking a home away from home. Its demise possibly came about as the railroad displaced the steamboat as a mode of mass transportation in the area. Other contributing factors could have been the aging of the structure and Ann Morris, and the construction of the "modern" Artesian House by Alfred E. Lewis in 1891. It appears the building burned or was demolished by 1901. The lot has remained vacant since this time. In late 1896, the Morris House was leased and called the Aline Cottage. The "Aline House" was mentioned inThe Pascagoula Democrat-Star of October 15, 1897. No further information. Charles L. Dyer, Along The Gulf, (reprint: The Women of the Trinity Episcopal Church: Pass Christian, Mississippi-1971). The Daily Herald, "Mrs. Ann Morris Obit", October 10, 1900, p. 8. The Daily Herald, "Mrs. George Hill dies", December 20, 1933. The New Orleans Times, July 1, 1866, p. 1. The New Orleans Times, "Morris House, Ocean Springs", July 1, 1866. The Ocean Springs Record, "Frank Bryan House", March 2, 1995. The Pascagoula Democrat-Star, “Niced Furnished Rooms”, July 4, 1884. The Pascagoula Democrat-Star, “Ocean Springs Locals”, January 31, 1896. The Pascagoula Democrat-Star, “Ocean Springs Locals”, July 11, 1897. M. James Stevens Collection, Biloxi Public Library, Biloxi, Mississippi. US Census - Jackson County, Mississippi (1860, 1870, 1880, 1900, and 1910).